Database Administration Sessions. 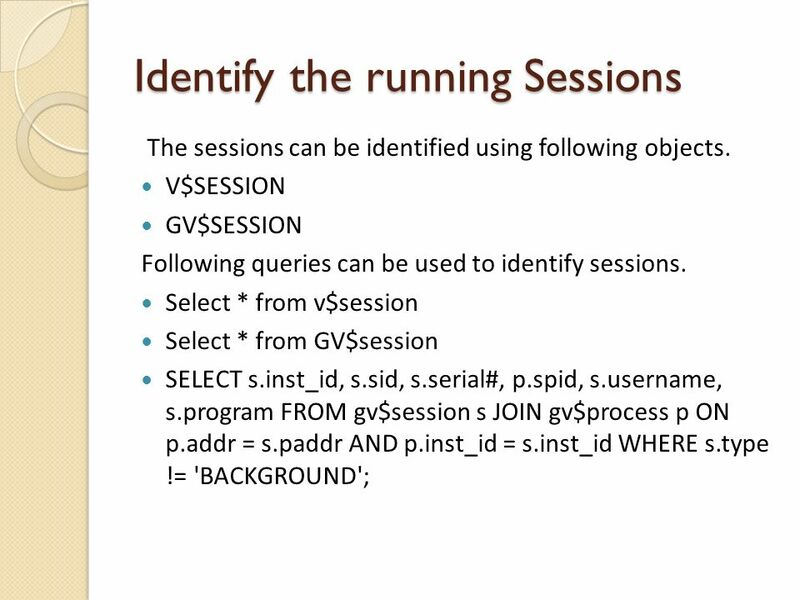 Identify the running Sessions The sessions can be identified using following objects. V$SESSION GV$SESSION Following. 3 Killing the session The basic syntax for killing a session is shown below. 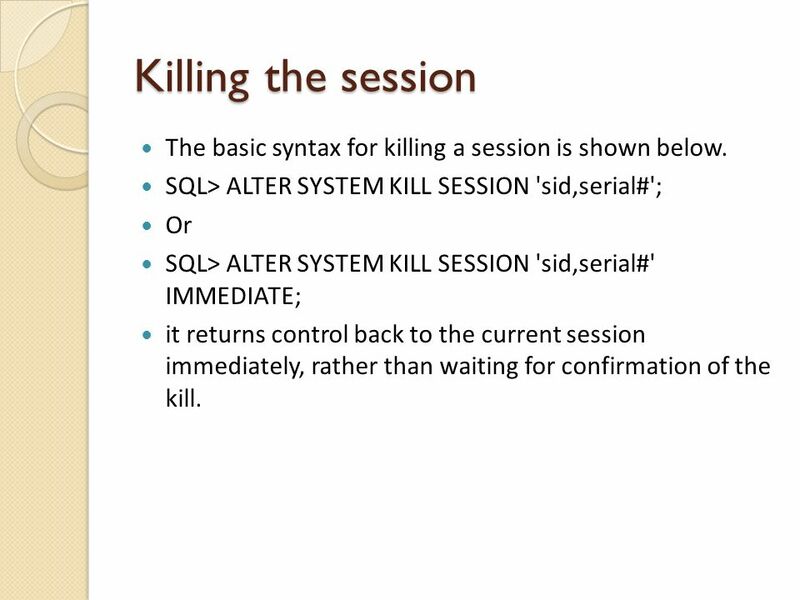 SQL> ALTER SYSTEM KILL SESSION 'sid,serial#'; Or SQL> ALTER SYSTEM KILL SESSION 'sid,serial#' IMMEDIATE; it returns control back to the current session immediately, rather than waiting for confirmation of the kill. 4 OS approach The Windows Approach To kill the session on the Windows operating system, first identify the session, then substitute the relevant SID and SPID values into the following command issued from the command line. 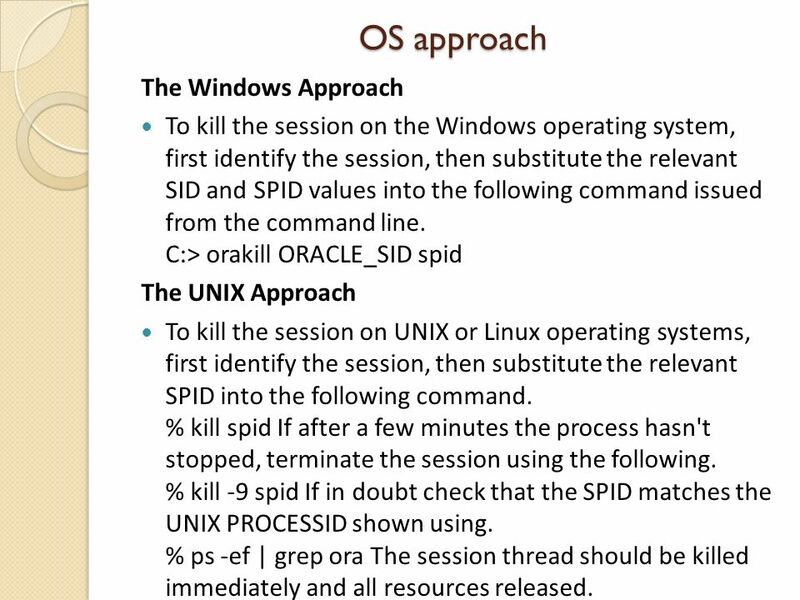 C:> orakill ORACLE_SID spid The UNIX Approach To kill the session on UNIX or Linux operating systems, first identify the session, then substitute the relevant SPID into the following command. % kill spid If after a few minutes the process hasn't stopped, terminate the session using the following. % kill -9 spid If in doubt check that the SPID matches the UNIX PROCESSID shown using. % ps -ef | grep ora The session thread should be killed immediately and all resources released. 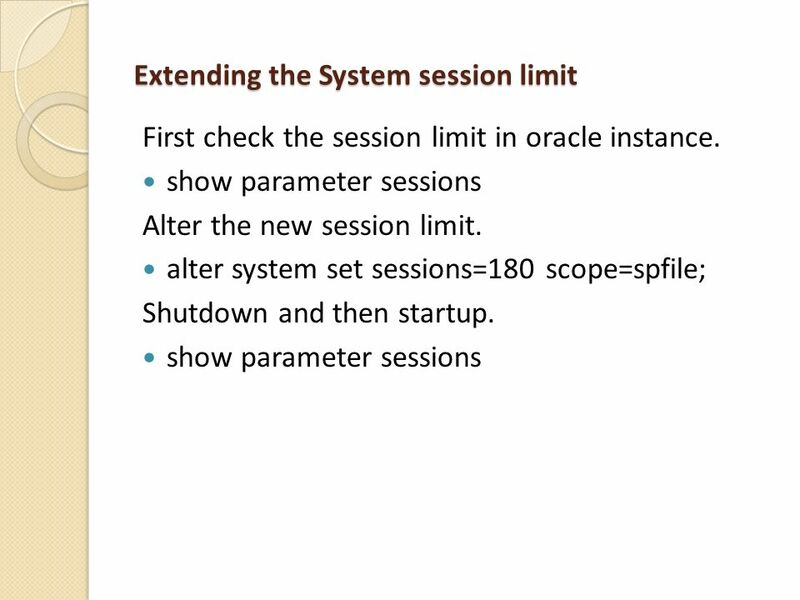 7 Oracle Session views v$sessmetric This view is new in Oracle 10g and allows improved timing and statistics. v$session_event This views is similar to v$system_event. However, it breaks it down to currently connected sessions. V$session_event has also the column max_wait that shows the maximum time waited for a wait event. v$session_longops Use v$session_longops if you have a long running pl/sql procedure and want to give feedback on how far the procedure proceeded. If the following Procedure is run, it will report its progress in v$session_longops. The Procedure will also set the module attribute in v$session which makes it possible to find the sid and serial# of the session. 8 v$session_wait This views shows what wait event each session is waiting for, or what the last event was that it waited for. In contrast, v$session_event lists the cumulative history of events waited for in a session. The columns P1, P2 and P3 are parameters that are dependant on the event. 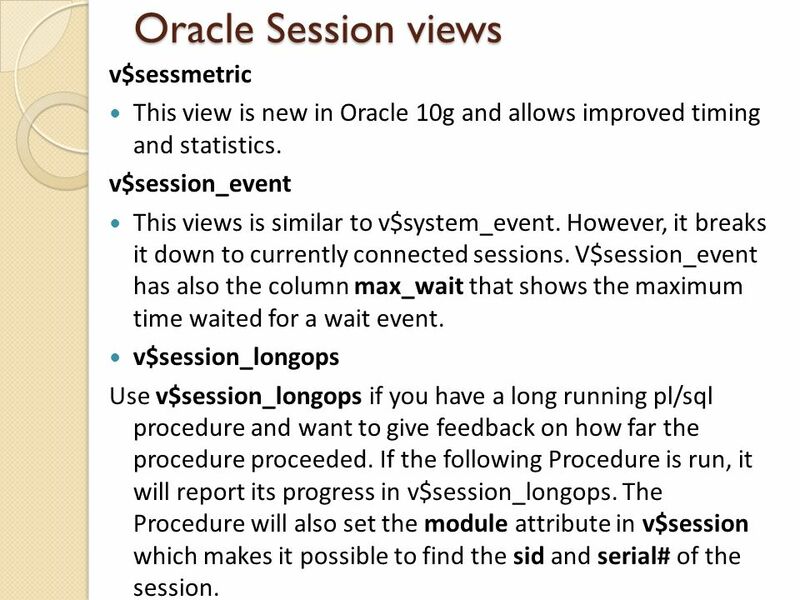 With Oracle 10g, v$session_wait's information will be exposed within v$session as well.Since 10g, Oracle displays the v$session_wait information also in the v$session view. 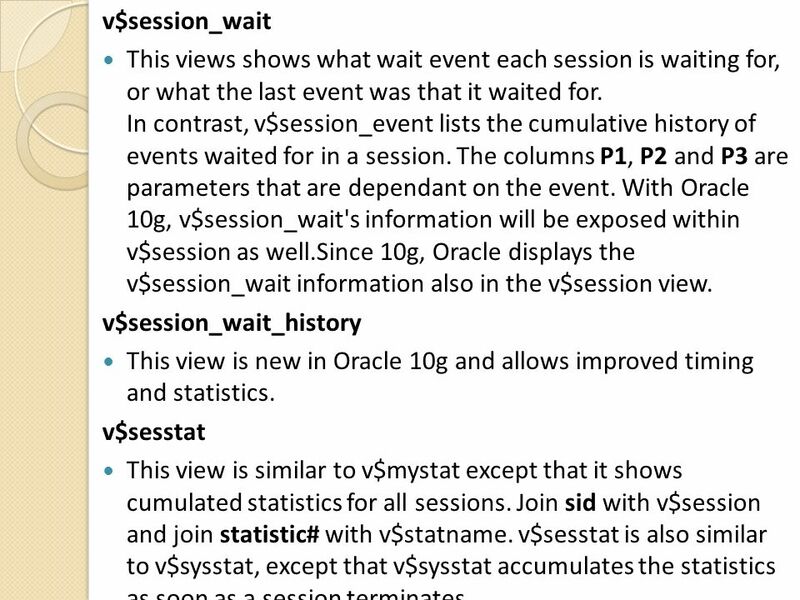 v$session_wait_history This view is new in Oracle 10g and allows improved timing and statistics. v$sesstat This view is similar to v$mystat except that it shows cumulated statistics for all sessions. Join sid with v$session and join statistic# with v$statname. v$sesstat is also similar to v$sysstat, except that v$sysstat accumulates the statistics as soon as a session terminates. 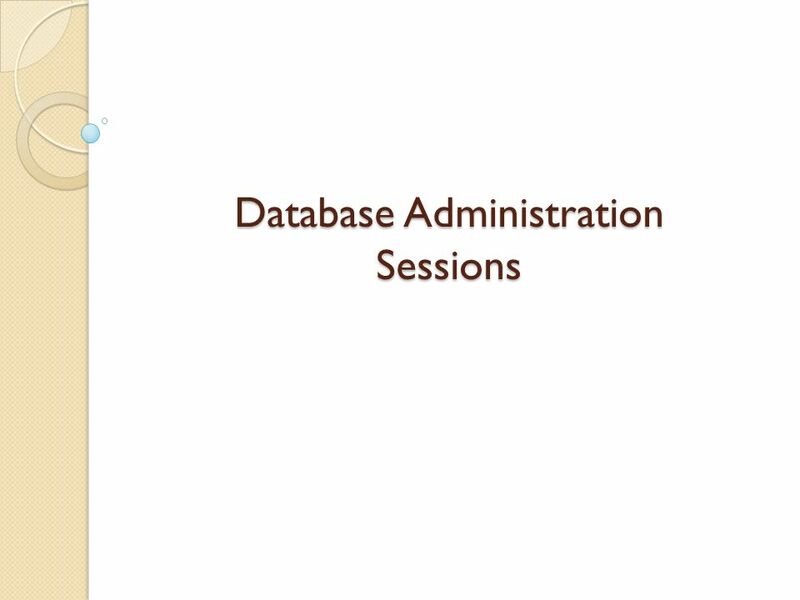 Download ppt "Database Administration Sessions. Identify the running Sessions The sessions can be identified using following objects. V$SESSION GV$SESSION Following." INTRODUCTION TO ORACLE Lynnwood Brown System Managers LLC Introduction to Oracle Automatic Storage Management (ASM) Copyright System Managers LLC 2008. 1 Chapter 16 Tuning RMAN. 2 Background One of the hardest chapters to develop material for Tuning RMAN can sometimes be difficult Authors tried to capture. 9 Copyright © 2006, Oracle. All rights reserved. Automatic Performance Management. Query Methods (SQL). What is SQL A programming language for databases. SQL (structured Query Language) It allows you add, edit, delete and run queries. Password Management for Oracle8 Ari Kaplan Independent Consultant. INTRODUCTION TO ORACLE Lynnwood Brown System Managers LLC Backup and Recovery Copyright System Managers LLC 2008 all rights reserved. 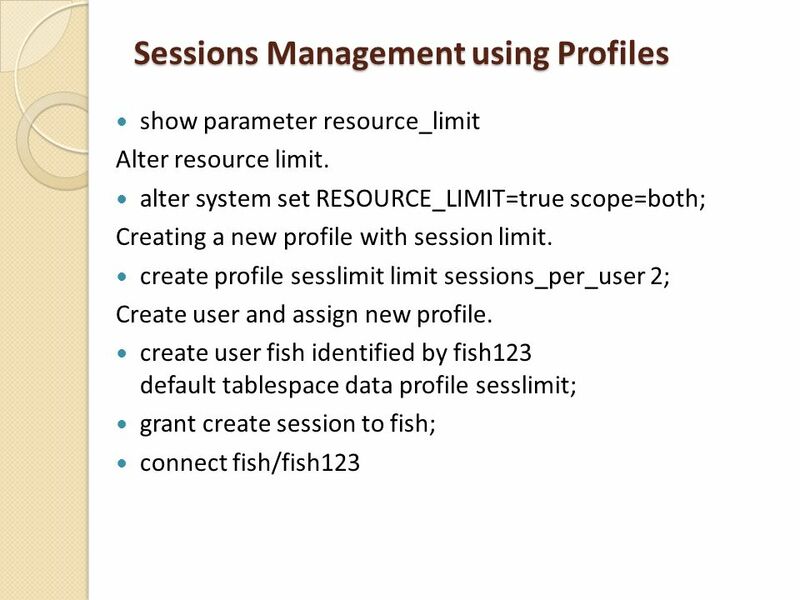 IS 432: DATABASE ADMINISTRATION Lecture 4: Parameter Files. Information Systems Department 1. Oracle9i Database Administrator: Implementation and Administration 1 Chapter 12 System and Object Privileges. Murali Mani Persistent Stored Modules (Stored Procedures) : PSM. Installing Oracle9i RAC Release 2 on HP OpenVMS Systems.